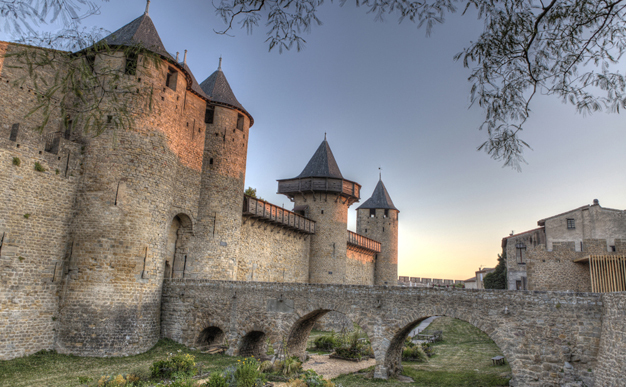 Discover the ramparts and the château of the Counts of Carcassonne, in the heart of the fortified city. These Gallo-Roman and medieval masterpieces of military architecture have been UNESCO World Heritage sites since 1997. The city’s three kilometres of ramparts, two fortresses (4th and 13th centuries), four gates, 52 towers and arrow slits offer remarkable views of the surrounding area. The château of the Counts of Carcassonne stands at the centre of the city’s defensive system. The site, which has been inhabited since ancient times, was protected against the Late Roman Empire by a Gallo-Roman wall. Despite these fortifications, the city was occupied by the Visigoths, Saracens and Franks in turn. 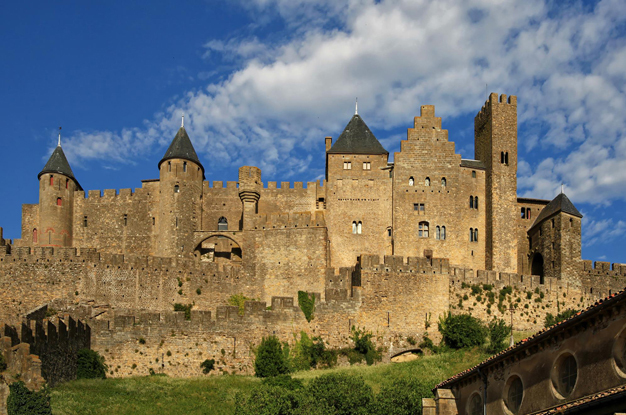 The château, once the seat of power of the Counts of Carcassonne, and then of the famous Trencavel family in the 12th century, fell under royal ownership following the Albigensian Crusade (1209-1229) initiated by Pope Innocent III. Carcassonne, which was accused of complicity with the Cathars, was besieged and fell in 1209. It was annexed to the royal estate in 1226 and overseen by a seneschal. The city subsequently became a stronghold protected by a double outer wall. It defended the border between France and Aragon until the Treaty of the Pyrenees in 1659. In the 19th century, the architect Viollet-le-Duc restored the fortified city and completed the 13th century reconstruction work. At the time, the city was on the verge of demolition and was used as a stone quarry. For over 50 years (1853-1911), Viollet-le-Duc and his successor Paul Boeswillwald, gave it back its medieval appearance, destroying the secondary constructions between the outer walls, using grey roofing stone for the towers, and restoring the décors and hoardings. In the 1960s, the Gallo-Roman towers were topped with tiles. Inside the city, Viollet-le-Duc also restored the basilica of Saint-Nazaire, combining a Romanesque nave and aisles with a Gothic choir and transept. The basilica features remarkable stained-glass windows, the oldest of which date from the 13th century. Several stone pieces from the basilica are on display in the château's museum. The château is a must-see attraction for anyone wanting to learn about the city’s history and its restoration by Viollet-le-Duc, understand its interior and exterior defensive system, visit the keep, admire its Romanesque frescoes, its Roman, Romanesque and Gothic architectural treasures, Lady Carcas, the city’s archaeological collections covering 2,500 years of history, a presentation film and a fully renovated gift shop in one of the most attractive rooms in the château. The Northern Gallo-Roman rampart, its superbly preserved ancient round towers, stunning panoramic views across the Montagne Noire, and 1,000 years of military architecture. Average length of visit: 20 minutes, exit at Porte Narbonnaise. The western medieval rampart, the bishop’s square tower, the Cathars and the inquisition tower, Viollet-le-Duc’s restoration work, spectacular views across the city, the basilica of Saint-Nazaire, the theatre and the Pyrenees. Average length of visit: 30 minutes, exit at the Saint-Nazaire tower.